A lot of people pointed to the injury sustained by Angel McCoughtry was the biggest detriment to the team not moving past Washington in the 2018 WNBA Semifinals. 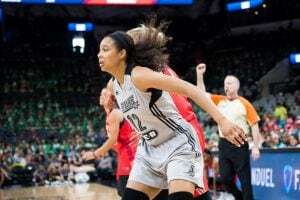 What was not discussed was the Atlanta Dream losing Damiris Dantas for the second half of the season due to a season-ending ankle injury, which was also a huge loss of an important rotation player. When healthy, Dantas showed coach Nicki Collen and her staff what she can do. 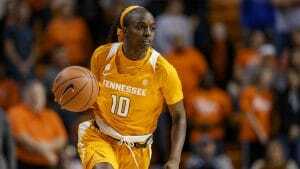 Her 10 points in eight minutes against the Indiana Fever on July 13, her last game of the season, was an impressive performance and helped lead the Dream to a win. A 6-3 forward that can shoot, DD was missed, especially against the Mystics in the Playoffs. The injury robbed Dantas of her usual consistent performance on the court. In her fourth season in the WNBA and third with the Dream, the only professional player from Brazil averaged a career low 5.4 points and 2.4 rebounds in only 13.4 minutes a contest. After having surgery in August, Dantas has been rehabbing and is looking forward to playing ball overseas in South Korea this offseason for KDB Life Winnus. Follow Dantas and her Dream teammates this offseason here.